It’s just after midnight, and I have raced upstairs to check in with the science team. What has happened while the Night team has been sleeping? Has the Day team found something new? As I enter the core lab, there’s the same slow, rhythmic whirring of the logger and the wheezy heartbeat of the magnetometer’s cryocooler. The same night crew buzzing back and forth with split cores and technicians donning safety gear, awaiting the next core’s arrival… yet something is very different. It’s immediately obvious. 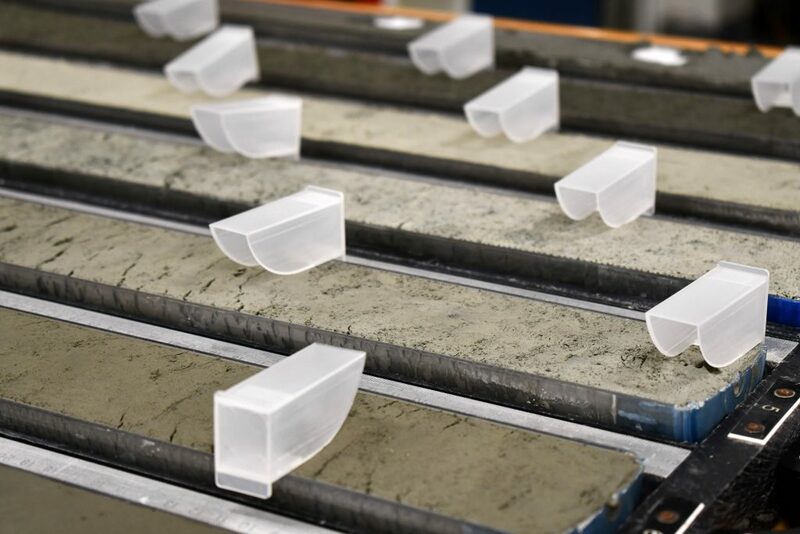 On the sampling table are the usual seven core sections, but instead of the more or less homogenous greenish-grey mud we’ve seen for days, several shades of lighter grey lie before me, and one core that’s markedly light in color. I can even see, in the core beside the palest one, a clear transition from mid-grey to this light material. Co-Chief Scientist Mike Weber tells me the pale color is an indication of carbonate. 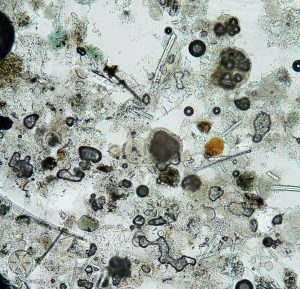 This has likely come from lots of forams (a kind of giant amoeba with a carbonate shell) and algae nannofossils (tiny fossils of single-celled algae). He says this is most likely a record of MIS 11 (Marine Isotope Stage 11), a period of much higher sea level and a warmer climate between 424,000 and 374,000 years ago. Such periods are also called super-interglacials. Looking at the sediment can tell us a lot about the environment at the time it was deposited. Diatoms (a kind of tiny plant) and radiolarians (a kind of tiny animal) have skeletons made of silica. 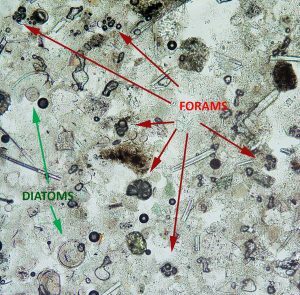 Forams and nannofossils are made of carbonate. It’s the balance of silica vs. carbonate microfossils in the sediment record that tells us who was winning the competition for survival. 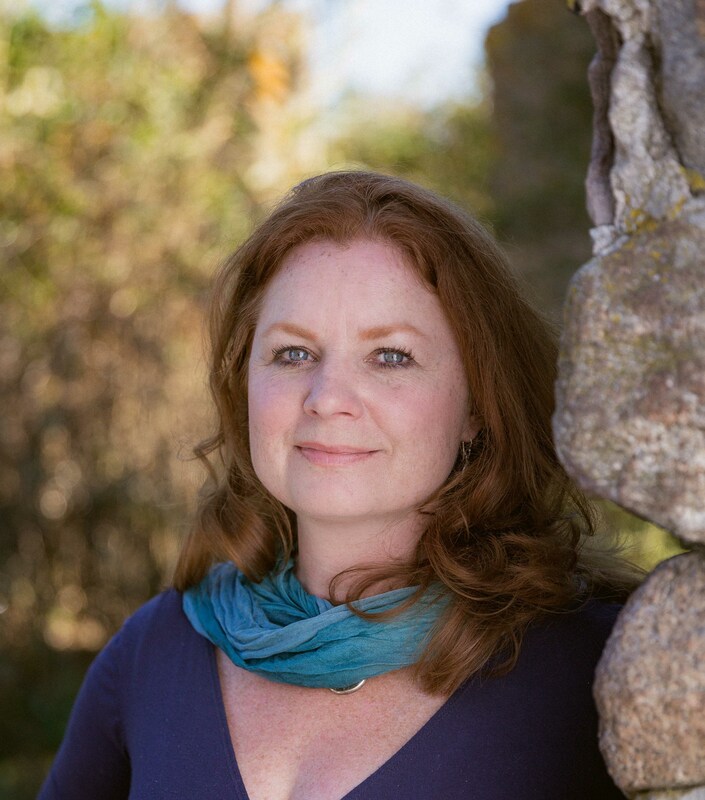 Diatoms and radiolarians prefer cooler conditions, while forams and algae thrive in warmer conditions. 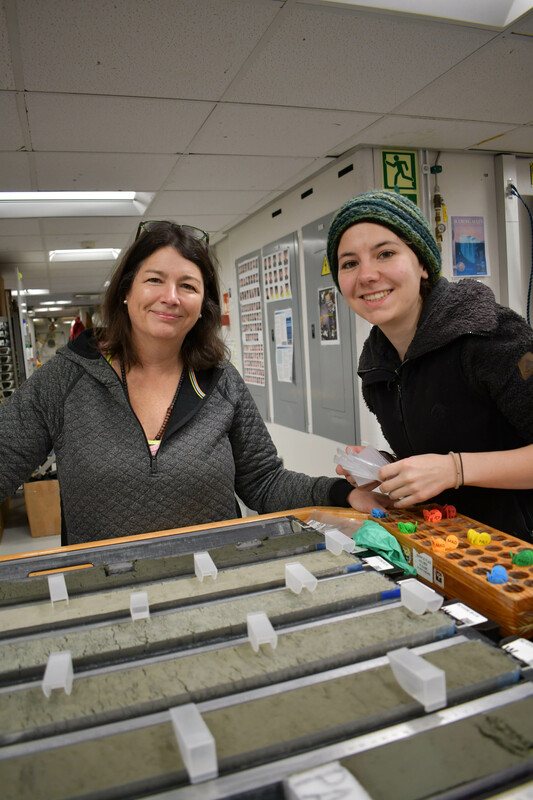 So, when we start seeing sediment rich in carbonate, like the pale sediment we’ve found, we know the climate was warmer when that material was deposited on the seafloor. 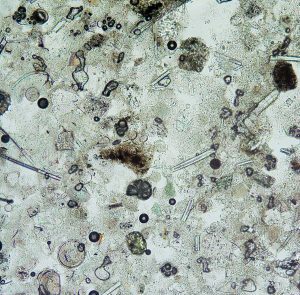 We looked at some of this carbonate-rich sediment under the microscope, and this is what we saw. There are several forams in these images. They look a bit like ammonites (which look a bit like snail shells). There are also some diatoms; they look like round discs with spots (pores), and one looks a lot like a sand dollar. Can you find them? We won’t know until we start drilling at our southern sites, and that time is coming. Sometime in the next couple of days, we’ll leave our northern drilling sites, bound for the Scotia Sea. None of us can wait to see what we’ll find! Keep scrolling down to the end of this post to find out if you found the forams and diatoms!